My first experience with a SuperGiant game was Bastion. While the game had stunning visuals and great music, the games mechanics were not particularly memorable. They weren’t terrible, it didn’t really do anything new compared to most action RPGs. Transistor on the other hand took its combat mechanic in an interesting direction. Players were able to pause time and set up a series of actions to execute. With their latest game Pyre, SuperGiant has implemented some of their riskiest and unique mechanics, in both gameplay and story, and they executed it impressively. Also, it’s still gorgeous as hell and Darren Korb’s music will stick with you after you’ve finished the game. Pyre brings the company’s beautiful art style and excellent music talent back with an RPG game whose main gameplay combat is essentially 3 on 3 fantasy basketball. You take the role as a fellow exile whose crime was knowing how to read. Literacy is outlawed in this world and you’ve been cast out into the Downside, a wasteland of sort with a few areas that still have some hints of life to them. In typical SuperGiant fashion the games aesthetic is vibrant and colorful. The character animations are incredibly fluid. The detail put into the worlds environments make them all gorgeous and memorable. Plains are lively with bright colors and verdant green fields and a deadly lava ridden area is flows with orange glowing lava and embers. Everything in this game is beautifully rendered and created. SuperGiant has decided to move towards more of a text based narrative. There is still a narrator, but they only appear when a rite takes place. Players can hover their cursor over certain words of the text to gain additional lore on places and characters. I personally enjoyed this, but fans of Bastion and Transistor with their excellent narrators, may not enjoy how wordy the game can be. And it is a lot. Between rites are only conversations either through the natural progression of the story or side conversations with the characters you have in the wagon. Also, be prepared for a lot of feels from this game, even before you reach the end. This is the strongest (and best) aspect of the game. Taking part in the rites is like playing a 3 on 3 fantasy sports game. As the rite begins a magical orb slams into the center of the arena. The player must grab the magical orb in the middle of the arena and transport or throw it into your opponent’s pyre until it is extinguished. The pyre’s strength is represented by a counter inside the pyre. But it’s the different player types who offer the real depth to the base mechanics. Every type has an aura surrounding them. The size of the aura varies in size depending on the class you’re playing. The giant daemon’s for example is massive, while the cur’s is fairly small. Each class can also launch their aura forward to attack enemies. Well, not all of them are launched forward, but the idea is still to obliterate your opponent, temporarily removing a player from the rite. This also occurs when a player jumps into the pyre to score. You can improve each players stats and abilities as they level as well as improve said abilities with talismans you can pick up as you explore the world or purchased with gold from the Slugmarket. This lovely little market and its strange owner will offer talismans and consumables before rites. 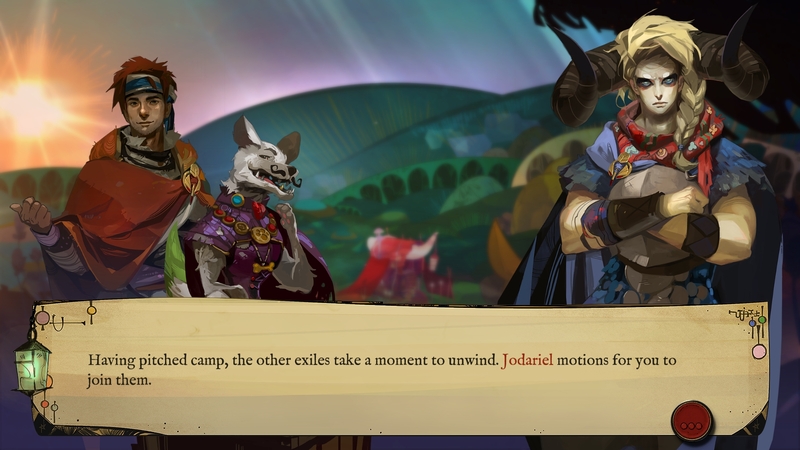 I thoroughly enjoyed my time with Pyre. The game’s vibrant art makes the world worthy of exploring and enjoying. And in typical Supergiant fashion the music is incredible and sticks with you even after you put the game down (I highly recommend buying the soundtrack. It’s amazing in its own right.) I know some may be bothered by the absence of a constant narrator, but I enjoyed the text based narrative and found it just as engaging. If you’ve been a long-time fan of Supergiant you’ll love Pyre and should experience this beautiful game.